New Jersey's Amiga User's Group! Hello, and welcome to ENJA! 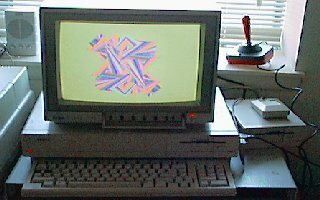 Our users group is dedicated to supporting our favorite computer, the Amiga, which, for those who don't know, is a machine based around the AmigaOS, Workbench, which is superior in many ways to both the MacOS and Windows, as well as being far easier to use than Unix or Linux. The club is now set to meet, at the Clifton Memorial Library, in the community room! It is at 292 Piaget Ave, in Clifton New Jersey! Click here for the printed directions. We are no longer meeting all that regularly. We will however meet periodically to get together and discuss things regarding the Amiga, and anything else that interests the group. If you'd like to chat with some Amiga fans, every Sunday night there is an online chat. Here are some of the more intersting Amiga links about. If you have any others, please let me know, I'll be happy to include them. My monster link list. (Which includes a bunch of Linux, and general compter sites as well. How about we get some members pages up here. If you have a page, send me the URL in an e-mail, and I'll post it up!. Everyone is welcome to attend our meetings, which cover the full spectrum of Amiga computer developments, procedures, and Whathaveyou. Last Updated: August 17th, 2004. If there are any suggestions for improvements on the web page, please email me, Bob.